I’m sitting in a splendid home overlooking the newly built houses, apartment blocks, towers and roads that wind their way through the valley below and over the hills in Jerusalem. The roofs of the many cars glisten in the sun making them look like water drops. Sunday is a working day in Israel. Yesterday all activity ceased. The roads were quiet. Here the commandment given to Moses by God so long ago is being honoured. No work is done on the Shabbat. Orthodox Jews are a religious group of Jews that give their time to studying the Torah, the first five books in the Scriptures. They teach the Torah at their religious services on Shabbat. Teachers in church, schools or universities are very important people in our lives to pass on truth they know to others. I remember growing up in the country in Ireland attending Church on Sunday. Chapters from the Old Testament, the Psalms and the New Testament were read. I believe these were were seeds that went into my heart. Later in my life I was given a bible. When I read it I came across passages that I remember hearing all those years ago. They came to my mind again. All scripture is important whether we hear it in song or at Sunday School or in the Torah or in Church or from a mother’s lips as she cradles her young child to sleep with a hymn. God’s word promises that it will not return to him void. So all those years ago the word of God going into me has borne fruit much later in my life. So it is with many people. I was listening to a young man’s testimony. After many years living a decadent lifestyle he remembers what his granny said to him. “If you call out to God he will answer your cry. ” in his time of need he did call. God answered and led him into new pathways. I turned to God when I was in need too. He led me to meet other people who knew about God and read the bible. I began to read it for myself and have done so down through the years. I use the Daily Bible everyday. That helps me cover the scriptures in one year. It has proved to be a great support in time of trouble or suffering. God brings to mind something I have read which will be just what will encourage me. As I travel and meet people high and low, I find they do not have a knowledge of the Word of God. They may have great qualifications but do not know the Scriptures. The Word of God is truth. Jesus said I am the way, the truth and the life. He was the Word of God become flesh. The scriptures are like bread. When one reads the words it is bread from God to strengthen one. The words bring healing to one’s body and soul. No other book claims to bring healing. for fifty two years. She awakes every morning and says, “Lord I’m in pain. I can’t do this any longer. I don’t want to go through the regime of needing someone else to lift me out of bed, bathe me and brush her hair. You need to help me Lord. I can do all things through Christ who strengthens me.” So starts her day. She has done this for fifty two years. She says her pain, despair and depression drives her to Jesus. She remembers words of scripture that will help her each day. I would not have got through rearing fourteen children and recovering from cancer without the Word of God and the Holy Spirit. I encourage you today to read the Word of God. Your life will never be the same. If you are suffering read the Word and you will get relief. Just say something like this. ” God if you are there please help me. Speak to me. Lead me in the right way for my life. Amen”. He will answer. Strangford Lough waters were like a mirror early today. The boats, newly parked in the bay below, are still. This morning I read these words from the Bible. For the despondent, every day brings trouble; for the happy heart, life is a continual feast. These words shook me out of feeling heavy laden and down. I looked up the meaning of despondent in the dictionary. Dejected, sad, depressed, disheartened, lacking hope or courage. One can be despondent because of unhappiness due to difficulties that you think will not be able to overcome. I was prone to despondency and despair before I had cancer. I definitely got depressed and it deepened. Situations in my life seemed insurmountable. But God saw me and had mercy on me. He healed me from cancer. I can’t afford to let myself get down or despondent. This word this morning shook me. I want to have a merry heart and a feast instead. I have so much to be thankful for. “Do not be downcast. Hope in God for I will yet praise him.” I began to thank God for all his blessings. I got washed and dressed. I decided to go out in the beautiful morning and let the cobwebs blow away. The warmth of spring is here. I praise God for life. Referendum Results like an Earthquake. Today the British Isles awoke to what someone would describe as an earthquake. The British public voted to leave the EU. Many people are concerned for their future livelihoods. “Why are the nations so angry? Why do they waste their time with futile plans? But the one who rules in heaven laughs. The Lord scoffs at them. In Psalm 11 David decides not to run away in fear when faced with overwhelming situation. “In the Lord I take refuge. How then can you say to me: “Flee like a bird to your mountain. Like, David of old who fought many battles and won them because his God helped him, let us trust in God. Let us thank and praise him for who he is and for what he has done for you. Do not give way to despair and fear. Do not rebel. Instead we are to pray for those in leadership so we can live in peace. Like an old chorus that goes, the name of The Lord, is a strong tower, the righteous run into it and they are safe. I will not run away to the mountains. Are You in the Wilderness? Jesus, the son of God came on earth as a baby boy to his mother Mary. He stayed at home till he was thirty. Perhaps Joseph died during that time. The scriptures do not tell us. He would have looked after and helped his mother and his siblings. He honoured his mother and cared for her. The time came when Jesus determined in his heart to accomplish the work he left heaven to do on the earth. He came to forgive mankind their sins, heal their diseases and destroy the works of the devil, who had ruled the earth since Adam and Eve sinned. His ministry began when Jesus was baptised in the Jordan by John. The heavens opened and the Holy Spirit descended on him in bodily form like a dove and a voice came from heaven , “You are my beloved Son, with you I am well pleased.” Those around heard the voice of God. God was honouring his son before the people and also encouraging Jesus to go forward in his work. Very often a son or daughter needs that encouragement and reassurance from a parent. The Holy Spirit led Jesus in the wilderness for forty days being tempted by the devil. He ate nothing. The devil came to divert Jesus from his mission. He knew Jesus was a threat to his dominion over the whole earth. The devil states that the kingdoms of the world have been given to him. Jesus came to take away the devil’s authority over the kingdoms of this world. The devil even knew the scriptures. It is good to pray. It is even better to fast and pray. The devil does not like you fasting. When one fast one becomes weaker and vulnerable and knows one’s need of help. The Holy Spirit and angels ministered to Jesus when he was fasting. In the wilderness he was removed from people, family and friends and all worldly distractions. After Jesus time of fasting he began his ministry. Do you feel as if you are in a wilderness in your life? You may be surrounded by people or work, but you have that dissatisfied feeling deep down. Has your life not turned out the way you wanted? Do you feel abandoned or neglected by God? Are you sick? Are you thirsty? Do you want your life to count? Do not despair. I was in Vancouver recently. As we drove along the highways in Vancouver I saw the sign for Hope on every overhead signpost. I thought it must be a large city up country. But it is a small town in the Fraser Valley, but if one wants to drive east in BC you will pass through Hope. As you drive towards Hope there are magnificent views of the mountains and the river Fraser. In October 2008 Brendan and I were speaking at a conference in BC. Canada. On the Sunday afternoon we were driving back to Vancouver along the Fraser Valley. We stopped for a coffee break in this town called Hope. The cafe was known for home cooked pies. Our host said you can get mile high pie here! I wondered what he meant. In the display cabinet was a variety of home baked pies, blueberry, chocolate, banana, summer fruits, apple, lemon meringue and rhubarb. I chose the biggest, the lemon meringue with a good helping of cream. It was the biggest lemon meringue I have ever seen. Lemon meringue is my favourite. In Canada the vans and the trucks, the rivers, the mountains, the highways and the bridges are big. Seven years ago I would have been bleeding from my colon and hoping it would go away. Over the next few years I got hopeless for my future. I was slowly dying. Until in 2010 I could not hide the bleeding any longer. I was getting weaker. I was in despair. I was unhappy, in distress, lost hope, lost heart, discouraged, I threw in the towel. I resigned myself that things would not get any better. I felt lonely and rejected, even though I had my family around me. I was depressed and felt misunderstood. Life was going on around me. I felt left behind. My children were doing well and leaving home. My home was getting empty and so was my heart. My husband was busy with his work. I didn’t feel I was needed any longer. Everyone seemed to think mum will be around forever. I had been strong for everyone one else, but now my strength was failing. What was there for me to do when all the children had left? I was hopeless. Over the next four months I went through treatment the doctors ordered and my family and many people in the body of Christ prayed for me. God healed me of 4th stage cancer. I am alive to tell others that God heals today. He is not a God far away who does not care. He is near to help us when we cry to him. My hope was gone but God in his faithfulness helped me. Today, nearly seven years later we were back in Hope. I asked the driver, “Did you know where the cafe is where I can get coffee and “Mile High Pie?” Hope is a small town. We found the cafe easily enough, off the main highway. I checked it out, and yes it was the same place. The cabinet was full of fresh sweet pies. I looked them over and found the lemon meringue! I enjoyed a coffee and pie at ten o’clock in the morning! Other customers were looking at me. In Canada people don’t eat sweet pie till the afternoon. In the seven years since I was in the town of Hope I have gone through the valley of death. God has brought me through the other side because I grabbed hold of hope in the goodness of God to heal me. 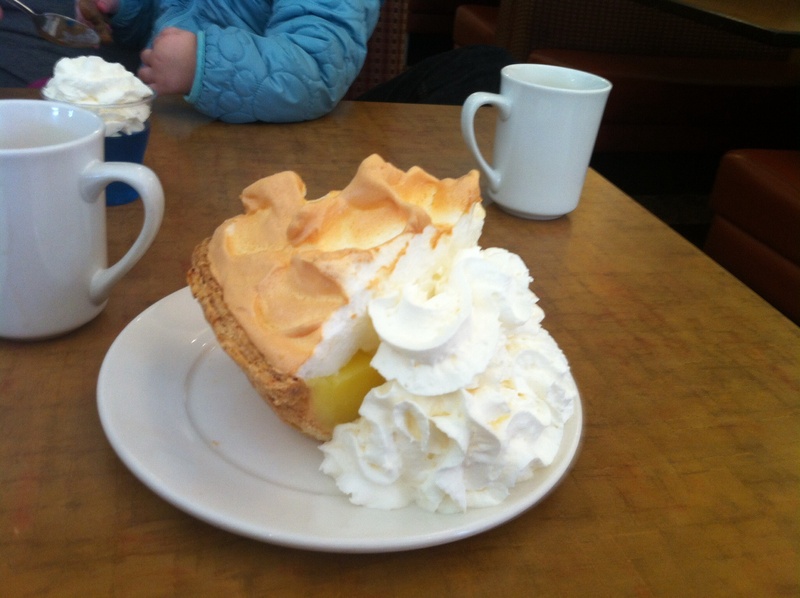 I celebrated my hope being restored as I ate the Mile High Pie in the town of Hope.